I have always loved science, especially Physics. Why? Because it’s practical, and, while I am an optimist, I am also a realist. I remember learning about frictionless plains in college and as I was riding my bike back to the dorms during a misty rain, I noticed that I was riding faster, and with no more effort. The blacktop surface had become slick and so my wheels turned more easily. Expand on this I told myself. How about skiing? When the slope is groomed, my skis glide and turn with just a slight shift of weight on the downhill ski. Slight. When it’s a powder day, I need my entire body to lean as the grip is below the fluffy surface. Water skiing. I am a single ski gal and when the lake is smooth, without wind chop or wakes, waterskiing is like gliding on ice cream. I have learned over the years that I actually prefer a slight bit of chop on the water because I need something to grip as I cross the wake and go wide for a elbow bending turn. All of this analysis and practical applicability comes from the LEFT side of the brain. The side of the brian that likes science, numbers, statistics and figuring things out. I am pretty organized when I work and write, which leans toward me favoring a left-brain approach. However, and equally alluring for me, is the right side of my brain. I have deduced, concluded and come to the realization over time, that I love this side of my brain just as much. Maybe more. When I am working on a speech, an article, a business book, a novel or any writing that can be helpful and/or entertaining for others, I am fully engaged in the creative side of my head. While the ideas actually come from the left side (they all require a decision making process in order to choose), the inspiration comes from my imagination, feelings and intuitive nature. I love this part of my brain. Why? Because it makes me feel good. Feeling good is a key element in knowing that you are doing what you love. I trust my intuition. Not only when it comes to writing or creating, but when it comes to decision making. I took a test once that determined if I was an introvert or extrovert. I thought for sure that extrovert would come out on top. Guess what? I was smack in the middle. This confused me at first as I take initiative, I present strategies, workshops and solutions to corporations, and I have helped thousands of professionals secure their ideal job. This is primarily extrovert stuff. But as I reflected on this, again over time (reflection is a right/left brain function), I realized that it made total sense. Introverts need solitude. I love solitude. To reflect, to think, to create. I need to put on my own quiet type of meditative music in order to write well. I need to get away from distraction. The same goes for creating a speech, a TEDx talk, a seminar. I also discovered that the introvert in me brings out my right side more, so I now celebrate that side of me. I use my left brain to edit. Once the initial creative process is complete, I actually physically move to a different surrounding (think couch for right-brain and desk for left-brain). I officially go into business mode. Right now I am working on two books. 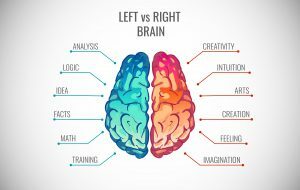 While one may seem more practical or left-brain, as it involves a lot of data, science and analytics, it is actually just as creative or right-brain for me. The flow is important and the feel of the book as much. My second work of fiction that I am working on (a Novel) is also both sides. I came up with the idea years ago while at the Louvre in Paris. I saw a statue, which captivated me, and I just knew it would be the center of my story. I then researched the origins of the epic piece and discovered that there was an ancient mythological fairytale tied to it. Hence, the backbone of my story, which is a new telling of this fairytale – complete with twists, turns and a more modern day version. My left brain laid out the entire synopsis and the chapter by chapter outline, the character traits and habits. My right brain started writing. 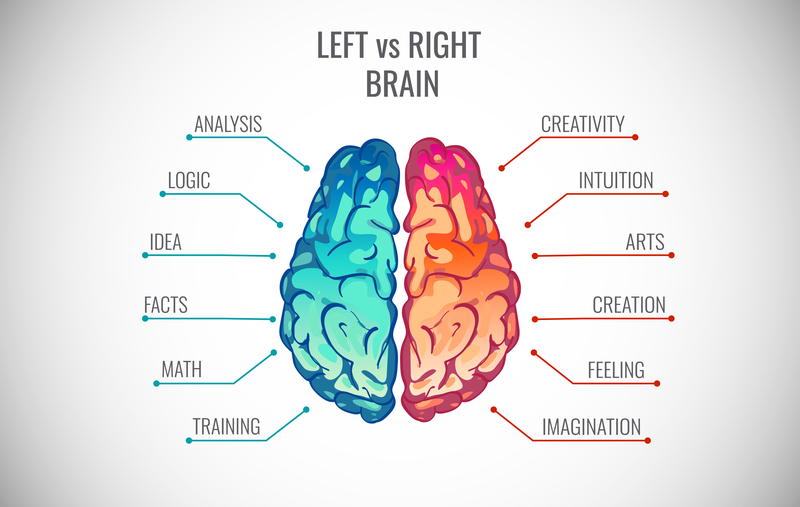 Which side of the brain do you think is your dominant side? I’d love to know!